All across America, cities are rebounding. Locally, cranes and temporary fencing have created new jungles in parts of Minneapolis and St. Paul, as thousands of new units push our inner city populations to levels not seen in decades. A new generation of so-called “Millennials” is moving back to the places their parents and grandparents forsook, finding ring road T.G.I. Friday’s and their promise of Endless Appetizers unappetizing, for now. And so a new arms race has started among cities trying to attract this hot young talent, courting them with exciting new amenities like farmers markets, transit improvements, and sidewalks. More than any other city, Portland–Perfect Portland–emerges in conversation as a national model, and something to shoot for. What can we learn from other cities? It’s clear that most, if not all, cities in America and around the world are largely the same, and so we can assume that something that works well in one city will probably have the same effect in another, regardless of whether or not the cities are at all similar. In order to get to the bottom of this important issue, I thought that the best way to see it would be in person—and so I reached into the jar in which I keep all the money I save by not owning a car, grew out my sea beard, left my cat with my boyfriend’s parents, and headed out to Portland to see just what it is all these people are talking about–what’s beyond the hubbub, indeed. I set out on Friday evening, spent three nights there, and flew back on Monday evening. The return trip had a layover in Atlanta. Due to an unlucky gamble with Priceline’s Express Deals, I ended up in a hotel out by the highway–and not even by the mall. On the other hand, it was handy to experience the city’s bus system as I had to use it to get back and forth some number of times. I quickly found that all the bus stops served by the Greater Portland Transit District noted, helpfully, what buses stop at each which was very helpful for an infrequent (or first time) user. Point, Portland. Though, the people on the buses seemed to know each other and as such had long and loud conversations about the comparative size of different bodybuilders and tumors. Not very common in Minneapolis. Point, Minnesota Nice. There were many things going on in Portland! What it is, is an old fishing and trading town, much of which was built back before we all had to have all these long conversations and “blogs” about how to build things. Whipping out my emoji magnifying glass, it was easy to see why people talk about it so much. In the whole 3+ million person Minneapolis-St. Paul metro area, we do not have anything approaching the natural vibrancy, walkability, and resilience of the Old Port, the center city of a city of only 66,000 people. It’s just there. There were all sorts of other things going on too–signs of growth, etc. A new Whole Foods and Trader Joe’s were a few minutes walking distance from the Old Port in an area that had previously been a railyard, and it was clear that there had been some residential redevelopment near both of those things. In addition to those national chains, there were lots and lots of independent businesses as well, and not just touristy things. There was a lot of foot traffic and also many cyclists–even without much designated infrastructure. The nature of the town is that cars have to go slowly and pay attention, and it seemed like the cyclists were comfortable. There were trucks, selling food–food trucks, if you will. There was a guy on a skateboard playing a guitar. 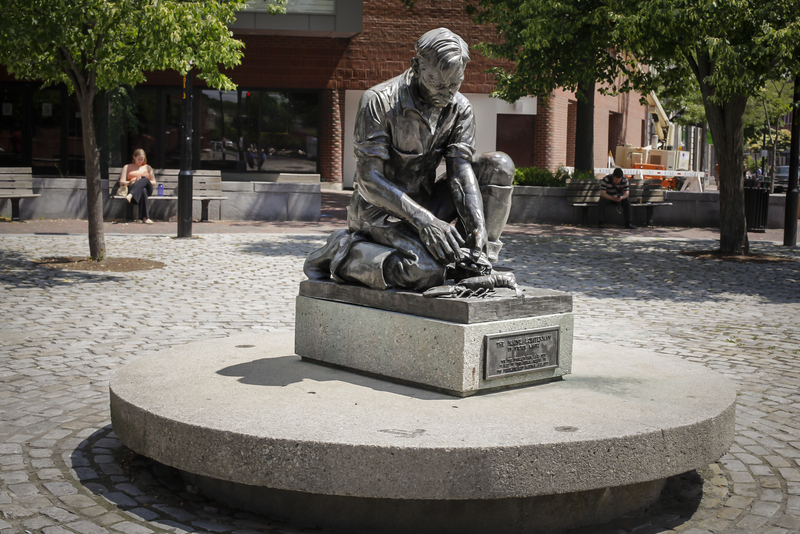 There was a movie theater behind a public plaza with a statue of a lobsterman across the street from a two block pedestrian mall. Looking at the aerial map now, you can see that there is a decent amount of structured and surface parking, but it feels much less obvious walking the tight, tree-lined streets. Most of the parking ramps seemed to have retail lining their bases. Some of the most fun I had in Portland, though, was on the sea. There is a neat ferry system connecting various outlying islands in Casco Bay, some of which are actually part of the City of Portland. It was less than $8, roundtrip, to take a ferry out to Peaks Island, where there are some cool shops and restaurants and, as I learned later, bike rental. The ferry to Peaks Island ran about hourly, so it was easy to hop off and walk around and hop back on at your leisure. A bit under a thousand people live on Peaks Island year-round, but that population swells to several thousand during the summer. It was initially developed in the late 19th century, and was known as the “Coney Island of Maine” due to the amusement parks and hotels and other entertainment on the island. Kind of like Lake Minnetonka’s Big Island, sounds like. In general, the maritime vibe was cool. Getting off the bus Saturday morning, there was the light and distant smell of the ocean. You could hear seagulls–I was pooped on, in fact. There was lobstah, and chowdah. There was whale watching (no whales were seen, though a backwards baseball hat-shaped sunburn was acquired) and a wharf. There had clearly been and was still some wharf-oriented development happening in and around the wharf. Portland is a city that is lucky enough to have an “iconic” thing going for it that is not contrived and terrible. I found that Portland has many similarities to Minneapolis and as such, might be a good city to look towards for inspiration. For example, according to Wikipedia, the Free Encyclopedia, a mall opened outside town several decades ago and hurt the downtown retail scene, kind of like what’s happened to Minneapolis over the same time period. Likewise, both cities are the primary city in what is otherwise a fairly rural state, and both are liberal cities in a state that’s a lighter shade of blue. Both regions are also mulling expansions of their respective transit systems, as we consider the Southwest Light Rail extension to Eden Prairie and Portland considers a bus link from their jetport to their Amtrak station. In particular, I very much enjoyed the nautical bent of the city and the transportation component of that, and wonder if there’s a way we can potentially export this success story to Minneapolis. Imagine it–ferries running up and down the Mississippi River, considerably faster than walking the same route. The ferry would also spur development along the Downtown Minnneapolis and St. Paul waterfronts, which have, to this point, been unattractive to real estate developers. We could then also repurpose the old post office building into a grand wharf, with lobstermen and fisherwomen plying their catches on downtown office workers and whale watching tours departing daily at noon. A local artist has put together these conceptual renders for us to consider. Of course, installing a heating system in the Mississippi River would be an expensive up front cost, but based on what I saw in Portland, it would clearly pay dividends over its decades of use. And, keep in mind, the key here is to plant the seed deep enough now that there’s no way to change our mind in ten years if maybe it comes up that this isn’t the best possible use of lots and lots of otherwise limited money. When walking past blocks and blocks of organically-grown, human-scaled, pedestrian-oriented buildings filled with a variety of commercial and residential tenants that create a successful, quality, memorable streetscape, remember: find an expensive gimmick and do that instead. Furthermore, this is a real opportunity to make some progress on the branding issues we have identified. Minnesotans all over the state have been searching, so thirstily, for an icon to call their own. We know that cities like St. Louis, with its Gateway Arch, and Knoxville, with its Sunsphere, have gained international recognition for their efforts to be internationally recognized. A truly world-class city would harness the 72% of the world that is ocean–what if our icon was whales? Oh my God. You went to the eastern Portland. Maybe that’s another flaw in the Priceline express deals? You get their choice of Portland along with their choice of hotel? I think both Portlands have a lot to love. While in the eastern Portland, we went to their Open Streets event, Sundays on the Boulevard (http://boulevardsundays.com/). It’s an interesting choice in streets because it runs parallel to a trail system so most people were just using the trails. I look forward to your next travel adventure, Nick. Haha, I also got about halfway through before I realized you were talking about the older, smaller Portland. I like the water taxi idea. That’s come up in Portland before, and I think also Seattle, but I think the Twin Cities may be a better prospect for the concept in having better destinations on the water to link up with each other. And in the winter, you could use hoverboats. How long’s it take to get through the Ford Dam lock? Between the climate, Ford Dam, and the relative lack of destinations in close proximity to the river, I just don’t see water taxis as being feasible in the Twin Cities. Even in DC, where ice is rarely an issue, there’s horrible congestion, and there are destinations in close proximity, water taxis haven’t really taken off much. Water Taxis would be cool, unfortunately, irresponsible aquaculture has eliminated it. The locks to downtown Minneapolis will be closed this fall, forever, to prevent the Asian Carp from migrating above the falls to the northern lakes. They also take so long to travel through that a water taxi would not be feasible even if they remained open. You can’t have the whales. Mankato already has them. I lived a half hour from Portland my entire childhood and never knew about half the stuff you spoke of here. Why? Because whenever my family went to “Portland”, that always meant going to the Maine Mall in South Portland – as you so cleverly analogized here. It’s hilarious, because it’s probably the last time the Maine Mall and the Mall of America ever get mentioned in the same breath, but it’s true. Also, to commenters.. I think we’d just prefer “The MAINE Portland”, not to be confused with “The Main Portland”. I wonder if St. Anthony Main could become more of an Exchange Street. There are a few nice restaurants, a couple uninspired bars, but no retail at all. That area has improved but could still be so much more.